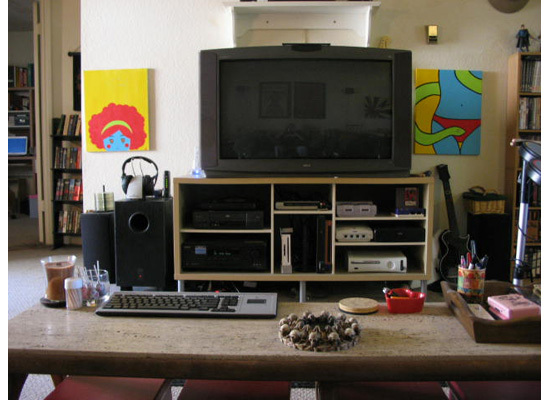 Community Blog by Conrad Zimmerman // My Gaming Setup, Can I Showz U It? 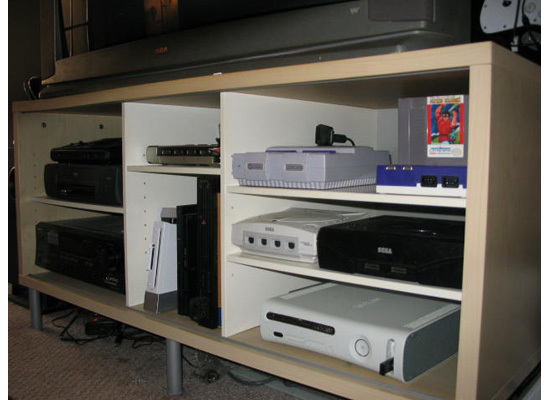 My Gaming Setup, Can I Showz U It? All the cool kids are posting photos of their gaming setups. I want to be a cool kid (or The Guy, not sure). So, without further ado, let me take you on a mystical, magical tour of my living room. This is my ugly couch. There's some history behind it, but I'm sure I don't know the half of it. I took in a guy a number of years ago who had no place to live and let him sleep in my dining room. A few months later, he found this little number out by the dumpster and brought it in. It reeked of "hippie" but I'll be damned if it's not the most comfortable piece of furniture I've ever owned. 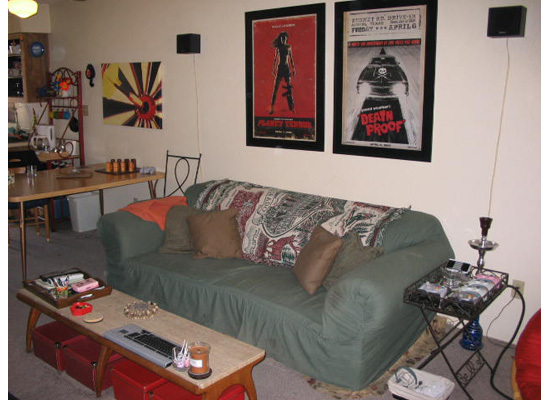 When the dude moved on, he left the couch and I've moved it with me to two different apartments since. As you may be able to discern from the right edge, the green is actually a cover. Indeed, that disgusting fabric is actually an improvement over what horrifying secrets lie beneath. We've gussied it up with some pillows and a blanket, but there's no denying the truth. 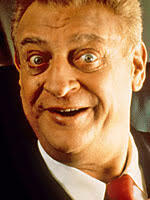 Oh, and Grindhouse rocks. In front of the couch, surprise surprise, is a coffee table. It's one of my favorite pieces of furniture. The top is one piece of solid, porous stone and I love the little, spindly legs. The view from my ugly couch. I'll get to the consoles in a moment but, first, some other stuff. The paintings on either side were done by my girlfriend, who was once pursuing a degree in art (then art history, and now anthropology). They're for sale if anyone's interested. Out of frame at the top is a shelf with the center channel speaker for my surround sound system. Other objects of note are the wireless headphones (for when someone in this house is a sissy and needs to sleep) and assorted guitar controllers which I neglected to take photos of. The keyboard is a wireless Logitech that's intended for use with a PSTriple, but works reasonably well with the 360. The shift key doesn't work, which can be frustrating, but it's exactly the right size for my needs, so I suffer in silence. Ahhh. Sweet, sweet consoles. 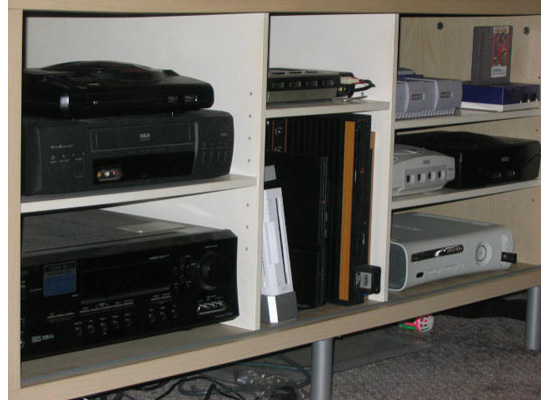 Going from left to right, there's a Sega Genesis, a Wii, two PS2s (one slim, one phat; the phat is used to run games off a hard drive with minimal load times), a SNES and a NES clone, a Dreamcast and a Saturn, and my buggy 360 which is badly in need of repair service. My original NES has a socket that I tightened a bit too much and requires the strategic use of rubber bands in order to play games, so I don't much use it since I snagged the clone at E3 for $25 in 2005. It sits in my closet along with a modded PSOne, a second Genesis that I've been planning to mod with a built-in multi-tap for Bomberman (as a gift to a friend), two Xbox units (one modded with new fans and faster drive) and boxes of accessories, controllers and cables. If I could stand in the closet, I'd have taken pictures. 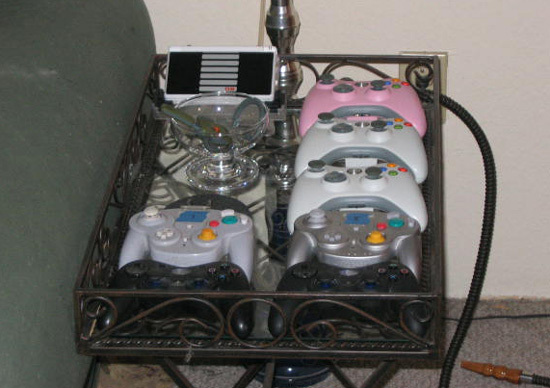 Conveniently located within reach of my assgroove is a collection of wireless controllers. The Wavebirds have come out of retirement on account of Brawl and the PS2 controllers are the very kickass ones produced by Logitech. Expensive bastards (for the time; average wireless controller price these days) but worth every penny. My wireless headset for the 360 is in the glass dish which also usually houses a few lighters in case I lose one and behind that is my DS resting in its stand (very handy for Professor Layton and Phoenix Wright). My woman has an unhealthy obsession with trays and cloth-lined baskets which could be used for storage. 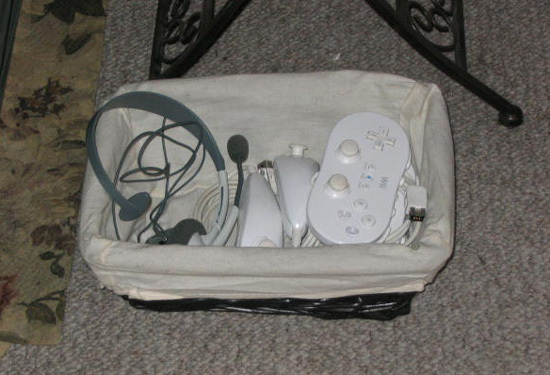 As a result, I have this little number at the foot of the end table for Wii accessories and my spare headset for when the wireless baterry dies out. Also, observe the better look at the horrific fringe that betrays the true nature of the couch. Well, what have we here? 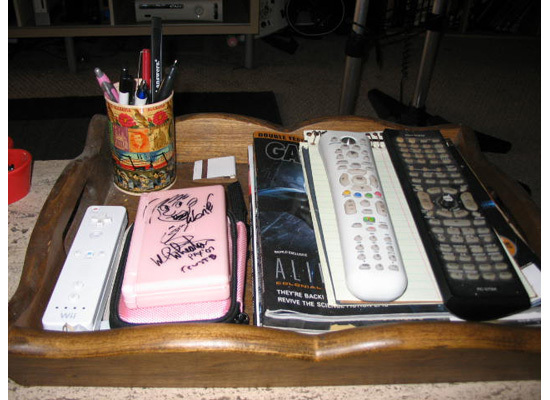 A tray on the coffee table. 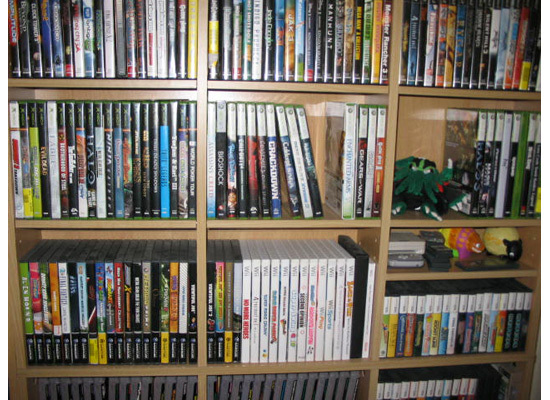 My gaming magazines get shoved in here and it's handy for keeping remote controls and such in, as you can see. I have a Wiimote that doesn't contain a rechargeable battery pack here, which I'll often use instead of the others out of sheer laziness. ZOOM VIEW IS GO! 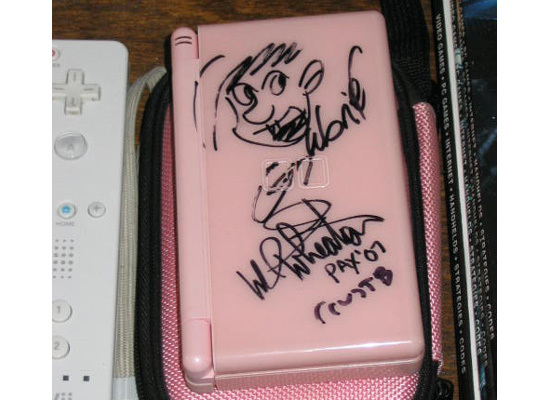 I'd be remiss if I didn't snap a picture of my girlfriend's pink DS. I asked Gabe from Penny Arcade to draw his character on it at PAX last year, and also managed to get autographs from Tycho and Wil Wheaton. She's very proud of it. Games! I love these shelf sets. You can pick them up from pretty much any major electronics retailer and they're the perfect size for both disc cases and cartridges. They're also great for paperback books if, like me, you have an overabundance of those too. 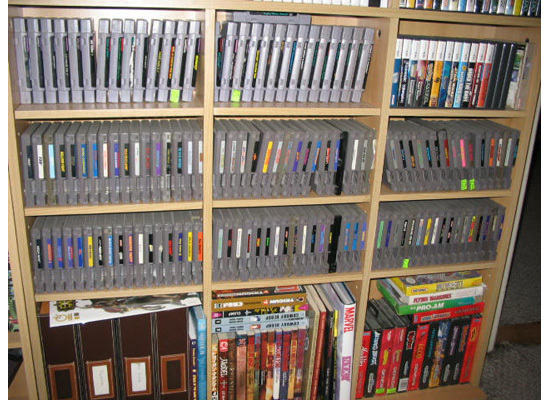 Everything is alphabetized where possible. 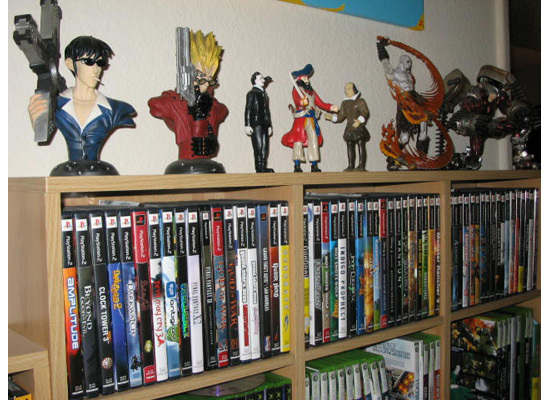 At the top, you can see about half of my action figures (Alice Cooper is out of frame to the left). That's about it for the game stuff, though I did take a couple more pictures just because I really like some of this stuff. This is my reading nook. The books are in the middle of being reorganized. I sort them by genre but it takes a fair bit of time and effort and whenever I run out of space for a genre or buy a new bookshelf, I have to start all over. 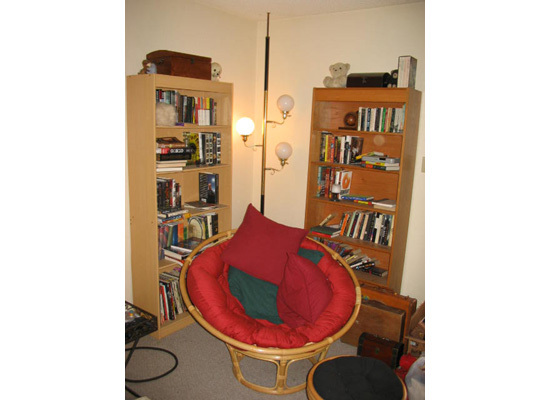 What rules about this picture is the floor-to-ceiling lamp. I love kitschy things like that. Also, on top of the left bookcase is my collector's edition of Catan, with the three-dimensional, hand-painted components. It's the pride of my board game collection. 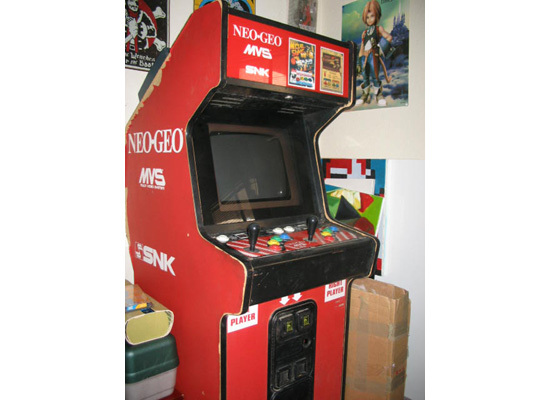 Last, but certainly not least, is my Neo-Geo arcade cabinet. This is the kind you'd usually find in pizza parlors and such, standing about five feet tall. I found it by the side of the road with an identical one next to it. After cannibalizing one for parts, I built one complete machine (I still have a second two-slot board in my closet). Sadly, there's a loose connection to the monitor and it stopped working a few months ago. I'll get to fixing it eventually. And that's about it. I'm loathe to come up with a better conclusion than this.